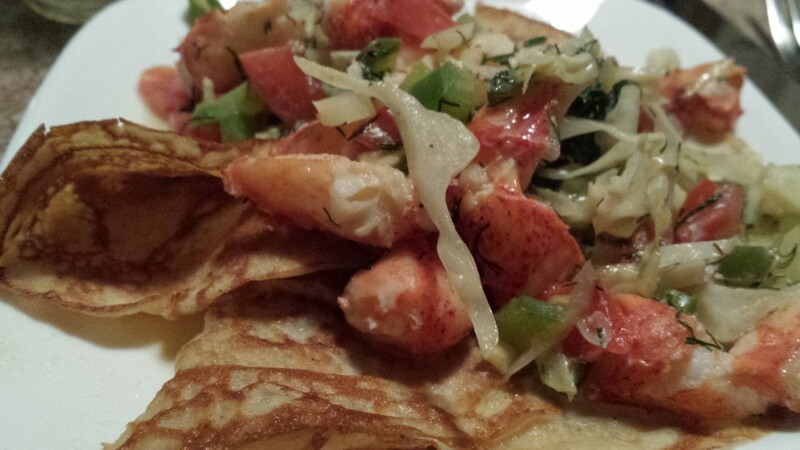 Continuing with making meals with local foods from Maine, I decided to make lobster crêpes. I make crêpe-filled menus often. Sometimes I use my favorite crêpe recipe from Julia Child, making the whole batch and freezing some for a later quick meal. (If you don’t have her crêpe recipe, you can read it or watch it online.) But I often make crêpes from something else that might be in over-abundance otherwise, such as when I make batter for King Arthur sourdough pancakes, which always makes twice as much as I need. In this case, I divide the batter in half, thin it with a little more milk and one or two more eggs and make the crêpes, saving me lots of time and energy. The sourdough lends a flavorful twist, too. Either way, crêpes are a big hit in our tiny house. Maine lobster is outstanding. Cold, fat, sweet, salty, strong, delicious. As we camp in Rockport, we are a just a few minutes away from fresh lobster at Graffam’s Bros. Seafood Market. You can order from them, too. A half-pound of lobster meat goes a long way, especially blended with local vegetables, cream and a bit of Dijon mustard. Add it to crêpes and you will have an amazing, satisfying dish. Don’t be afraid to be creative and play with this recipe. It will be delicious no matter what. PS – The low light in our camper doesn’t make for great photos, but I think you get the idea. Make crêpes or warm pre-made crêpes and keep them at the ready for final touches and serving. Prepare your ingredients. In a medium skillet on medium heat, melt the butter. Just after it is done foaming, sauté the garlic for about twenty seconds, then add the green pepper, tomato and cabbage. Toss to combine and sauté for a few minutes. Don't overcook the vegetables. The crunch goes well with the lobster. Add the lobster meat and sauté for another minute. Add the dill and toss to combine. Pour in the wine and let it cook for a couple of minutes, then add the cream and Dijon mustard. Stir it all together and let it simmer. It is up to you how much "sauce" you would like with your lobster crêpes, so adjust accordingly. We like a little sauce. Taste your creation to determine how much salt you'd like. We like cracked pepper on our lobster crêpes, so we go for it. It is up to you. Change it up if you'd like. Arrange the warmed crêpes any way you'd like -- wrap them around your ingredients, or fold them into quarters or halves and pour the lobster mixture atop them and serve.